Unlike a home, a car isn’t an investment and it will lose value every year. Of course, how much value your vehicles loses depends on the type of car you buy. Some brands and vehicle types retain their value better than others which means you can expect a higher resale value later when it’s time to trade it in or sell it. Non-luxury vehicles tend to retain value better than luxury vehicles for the obvious reason: most people who can afford luxury vehicles buy them new, not used. In terms of non-luxury brands, Subaru vehicles hold their value better than others. Subaru has won many Best Resale Value Awards over the last decade including the 2015 Best Resale Value Award from Kelley Blue Book. If you do buy a luxury brand, Lexus is the best bet for retaining your resale value. Lexus tends to offer more features per dollar than other luxury brands and it’s been named the Best Luxury Brand for Resale by KBB five years running. Planning to buy a new car in the near future? Here are 15 vehicles that will retain their resale value. The Toyota Tacoma is the true resale value king: both Kelley Blue Book and NADA consistently rank it as one of the top three vehicles for resale of any vehicle type. The Toyota Tacoma midsize truck has an expected resale value of 73% of its original sticker price after 36 months and almost 62% at five years, according to Kelley Blue Book. NADA also ranks it as the number one vehicle for resale. In 2015, the Tacoma beat the number two ranked vehicle — the Jeep Wrangler — by 5% after three years and 1.5% after five years. In 2015, Toyota won Edmunds.com’s Best Retained Value Award in the non-luxury division with a projected 52% residual value after five years. 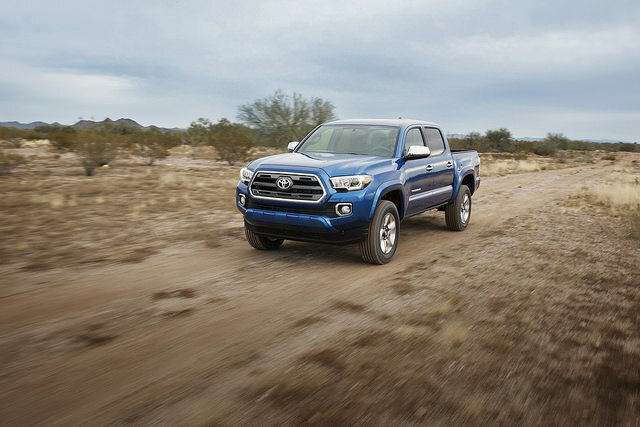 The 2015 Tacoma was named the best midsize truck for resale value by Edmunds.com and the latest model, which has been fully redesigned, is expected to maintain the same resale value as its predecessor.